BFBA (Burea for Foreigners, Borders, and Asylum) at the Directorate of General Security of the Turkish Ministry of Interior. 2001a. Illegal Migration in Turkey and in the World, Ankara, Turkish Ministry of Interior. BFBA (Burea for Foreigners, Borders, and Asylum) at the Directorate of General Security of the Turkish Ministry of Interior. 2001b. Documents and Views on Foreigners, Borders, and Asylum, Ankara, Turkish Ministry of Interior. De Gryse, P. 2001. “Nood aan een Uitbreiding van de Bescherming van Vluchtelingen in België.” In R. Commers and R. Blomaert, eds., Het Belgische Asielbeleid. Kritische Perspectiven. EPO. De Smet, L. 2001. “Minderjarige Asielzoekers in Belgie: Probleemstelling en Voorstellen.” In D. Cuypers, B. Hubeau and M-C. Foblets, eds., Migratie en Migrantenrect. Recente Ontwikkelingen Vol. 6, 359-371. ECRE (European Council for Refugees and Exiles). 2004. “Country Report Slovenia,” www.ecre.org.uk. ECRE (European Council for Refugees and Exiles). 2001. “Country Report Greece,” www.ecre.org.uk. Geddes, A. 2000. Immigration and European Integration: Towards Fortress Europe? European Policy Research Unit Series. Manchester: Manchester University Press. Het Belgisch Staatsblad. 2001. Wet Houdende Sociale, Budgettaire en Andere Bepalingen (Belgian Official Journal, Law concerning Social, Budgetary and Other Regulations). January 3, 2001. Içduygu, A. 2002. International Migration and Turkey. The Country Report of Turkey for the Continuous Reporting System on Migration (SOPEMI) of the Organization for Economic Cooperation and Development (OECD). Içduygu, A. 2000. “The Globalization of Mobility and the Politics of International Migratory Regimes: The Transit Migration in Turkey,” International Social Science Journal, (165): 357-367. Içduygu, A. 1996. “Transit Migrants and Turkey,” Bogazici Journal: Review of Social, Economic and Administrative Studies, 10 (1-2): 127-142. Kiriúçi, K. 2002. Justice and Home Affairs Issues in Turkish-EU Relations: Assessing Turkish Asylum and Immigration Policy and Practice. Istanbul: Tesev Publications. Kiriúçi, K. 1996. “Coerced Immigrants: Refugees of Turkish Origins since 1945,” International Migration, 34(3). Kiriúçi, K. 1995. “Refugee Movements and Turkey in the post Second World War Era,” Bogaziçi Research Papers, 1. Klein, K. 2002. “Bezetting van de Open Opvangcentra voor Asielzoekers, Occupation des Centres d’Accueil,” Retr: 10. 2002 from : http://www.kleinkasteeltje.be/nl. Lavenex, S. 2001. The Europeanisation of Refugee Policies: Between Human Rights and Internal Security. London: Ashgate. Official Journal of the European Union. 1997. C 254 19/08/1997. Okolski, M. 2000. “Recent Trends and Major Issues in International Migration: Central and Eastern European Perspectives,” International Social Science Journal, 165: 329-341. Papadopoulou, A. 2005. “Exploring the Asylum-Migration Nexus: The Case of Transi migrants in Europe,” GCIM Global Migration Perspectives (at http://www.gcim.org/en/ir_gmp.html), (23). Sitaropoulos, N. and A. Skordas. 2004. “Why Greece is not a Safe Host Country for Refugees,” International Journal of Refugee Law, 16(1): 25-52. Sitaropoulos, N. 2000. “Modern Greek Asylum Policy and Practice in the Context of the Relevant European Developments,” Journal of Refugee Studies, 13(1): 105-117. Toktaú, ù. 2006. “Turkey’s Jews and Their Immigration to Israel,” Middle Eastern Studies, 42(3): 505-519. UNHCR (United Nations High Commissioner for Refugees). 2006. “Asylum Levels and Trends in Industrialised Countries 2005,” Geneva 17 March 2006, http://www.unhcr.org/statistics. UNHCR (United Nations High Commissioner for Refugees). 2003. Statistical Yearbook 2003: Trends in Displacement, Protection and Solutions. Geneva: UNHCR. UNHCR (United Nations High Commissioner for Refugees). 2002. Country Operations Plan 2003, Republic of Slovenia. Geneva: UNHCR. UNHCR (United Nations High Commissioner for Refugees). 2001. “Asylum Applications in Industrialized Countries: 1980-1999,” Trends in Asylum Applications Lodged in 37 Mostly Industrialized Countries. Geneva: UNHCR. UNHCR BO Athens. 2000. Handbook on Procedures and Criteria for Determining Refugee Status According to the 1951 Convention and the 1967 Protocol, 3rd edition. Athens: 2000 (Greek translation). Vrecer, N. 2006. “The Integration of Forced Migrants from Bosnia-Herzegovina into Slovenia: Theory, Comparisons in the Anthropological Perspective.” Unpublished Ph.D. dissertation. Ljubljana: Ljubljana Graduate School of the Humanities. Wallace, C. 1996. “The Eastern Frontier of Western Europe: Mobility in the ‘ Buffer’ Zone,” New Community, 22(2): 259-286. Wet, V. 1980. 15 December 1980 Betreffende de Toegang tot het Grondgebied het Verblijf de Vestiging en de Verwijdering van Vreemdelingen. Zavratnik, Z. S. 2003. Migration Trends in Selected Applicant Countries, Volume VI – Slovenia: The Perspective of a Country on the ‘Schengen Periphery’. Ljubljana: IOM. ISNAD Aspasia Papadopoulou, Mila Paspalanova, Natalija Vrecer, Şule Toktaş, , Toktaş, Şule , Papadopoulou, Aspasia , Paspalanova, Mila , Vrecer, Natalija . "Transit and Receiving Countries: Refugee Protection Policies in Belgium, Slovenia, Greece, and Turkey". 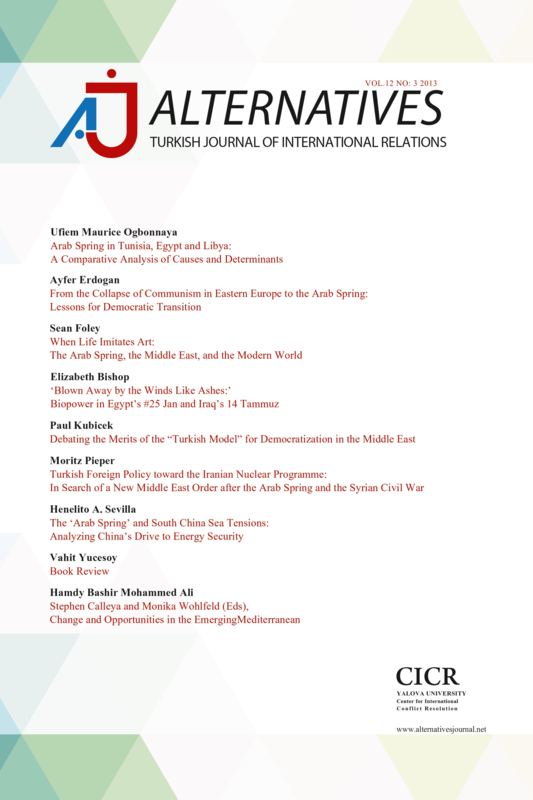 Alternatives: Turkish Journal of International Relations 5 / 1&2 (June 2006): 20-50.